Rob List movement, Nate Speare, voice, Jed Speare, sound. 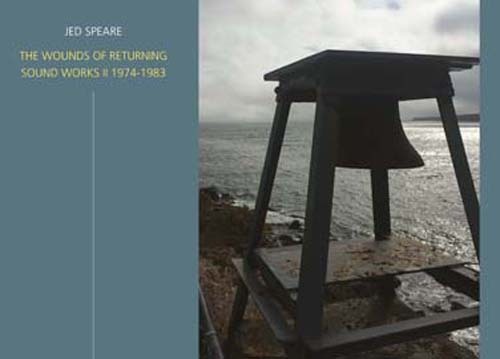 Farpoint Recordings are delighted to launch the new Jed Speare CD 'The Wounds Of Returning, Soundworks II 1974 - 1983 at Mobius, the artists-run center for experimental work in all media, located in Cambridge, MA. This new release features seven audio works from those years alongside extensive sleeve notes by the artist and a text by poet and artist George Quasha. The CD is housed in a special full colour fold-out booklet. The album is now available from the Farpoint Recordings shop: http://farpointrecordings.com/cds/jed-speare--the-wounds-of-returning/ Copies will also be available at a special launch price at Mobius on the 21st November. The launch will feature a special performance by WTSTST (Working Through Some Things in Space and Time). WTSTST is the trio of Rob List, movement; Jed Speare, sound; and Nate Speare, voice. They perform a unique process of articulated autonomies in proximity and collaboration. The works on this full-length album range from the hauntingly beautiful early chamber music compositions, Canto and Espy, and the text-sound crab canon Idiolect II, to four works for magnetic tape including the large-scale pieces, Écrier and White Strand. Écrier was a work composed and choreographed by Speare that was presented in a midnight performance series at the Intersection for the Arts in San Francisco in 1983. White Strand was a full-scale performance collaboration with Rob List and Wendelien Haveman created in a neon production shop of an industrial space south of Market Street in San Francisco. Mettle of Metal is borrowed from Speare's Cable Car Soundscapes record from 1982, placing it here in context with other tape works, while on the cable car record it concludes the entire album that begins as a documentary of different aspects of the cable car and ends with this tape composition based on cable car sounds. This unique collection of sound works, created by Speare early in his career, considers elements and concerns from music composition, industrial culture, sound art, and acoustic ecology. They all share common ground by affinity and temperament; composed chamber music is surprisingly juxtaposed with the act of his field recordings and working with magnetic tape, an aural and tactile modality he migrated to that provides all of the source material for the tape pieces produced after 1980. Jed Speare is a sound and multidisciplinary artist who has presented time-based arts internationally for over thirty years. His background is in music composition and in time that he spent at the Sonic Research Studio of the World Soundscape Project in 1978. He has also worked extensively in other media and with artists including Joan Jonas, Rev. Billy (Bill Talen), and with the choreographer and performer Rob List, with whom he has made several collaborations. In2008, The Wire magazine called him, “a pioneer of multimedia presentation.“ He is the creator of Cable Car Soundscapes (1982) on Smithsonian Folkways Records and Sound Works 1982-1987 (2008) on the Family Vineyard label. The new album, The Wounds of Returning, Sound Works 1974-1983, on Farpoint Recordings delves further into his background in sound, that has also entailed conceptual research about and implementation of urban Quiet Zones in Massachusetts and Toronto; advocating for sound in urban planning in Tainan, Taiwan; and working as a Hearing Conservationist, administering hearing tests to industrial workers in central Massachusetts. His single-channel and video installation work has been developed through residencies at the Experimental Television Center. His sound art composition is derived exclusively from field recordings he undertakes, that are the raw material that he shapes, develops and transforms. Over the past twenty years his many projects, performances, and service has been primarily affiliated with Mobius, where he has been an Artists Group member since 1995 and its Director for 12 years; with Studio Soto, as Director for six years; the New England Phonographers Union, as a founding member initiating site-specific recordings, projects, and concerts; and the American Society for Acoustic Ecology, on its Board of Directors.